4G era is coming, the vendors all over the world are trying their best to win in the game. As the top euipments supplier in China, it seems HUAWEI is leading the trend towards to LTE. HUAWEI E5776 4G LTE Pocket WiFi comes out during this time. 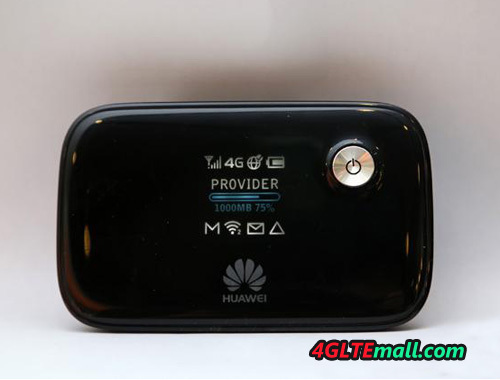 Folloing HUAWEI E589 4G LTE Mobile Pocket WiFi, HUAWEI E5776 4G LTE Router has many improvements in features. First and most importantly, HUAWEI E5776 4G Router supports up to 150Mbps download speed, which is almost the fastest speed that a 4G device could support. 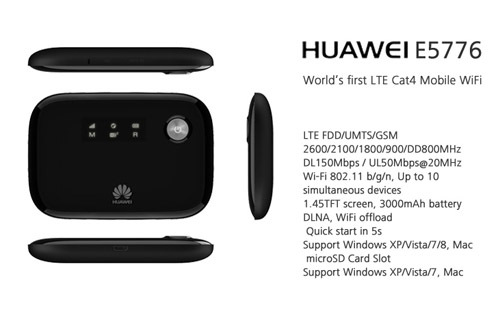 Since LTE –Advanced technology is applying; HUAWEI E5776 is somewhat like LTE-advanced gadget. As the 4th generation of HUAWEI E5, we could see the workmanship and design is more simple and easier to operate for users. It’s still classy black like HUAWEI E589, with the horizontal display and compact design with 150 grams. There is three buttons on this 4G hotspot, on the face is the power button, two sides are WPS and Reset button. For users, just press power button and it will auto connect to the fastest network available. If 4G is not available, it will auto jump to 3G network connection and choose the fastest network so as to give use best surf experience. Below are the specs for reference. The freely available “Mobile WiFi” app allows you to control and monitor the device on Android ™ – ® or iOS smartphones and tablets during her through SD Share pictures, documents, music and video files, you can share with friends. Up to 10 devices can you with up to 300 Mbit/s to connect with a local wireless network – with a running time of approximately 10 hours, ensures full power of 3300 mAh battery. Thanks to the built-in battery you can also easily invite other devices via USB. Another highlight of the wifi device: The E5776 is compatible with all popular wireless devices and can be configured using any web browser. From Huawei E5776, we could see that HUAWEI is leading the 4G LTE technology and will release more and 4G LTE mobile broadband for better surfing.